Tiera Moore wanted a master’s that focused on global studies. She found it with an interdisciplinary liberal arts program, the online Master’s in Applied Arts & Sciences (MAAS) at UNC Greensboro. The program allowed Moore to design a program around her passions and include time for study abroad, arranged through UNCG’s International Programs Center. She is currently working toward the program’s Global Studies Certificate, which she will earn in addition to her master’s in December. 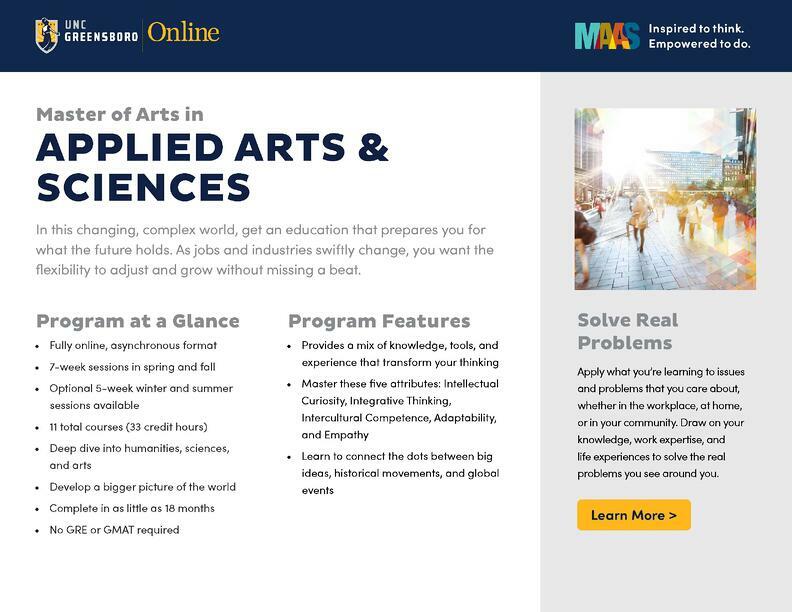 The fully online MAAS degree lets students dig deep into the humanities, sciences, and arts with real-world projects. In the customizable program, students use their own experiences and new skills to solve real problems. Moore says it was important to be in a master’s program that allowed her to pick courses from different disciplines. “That way I could sort of create a curriculum that was more focused on my passions and interests versus one that’s sort of prescribed already,” she says. Moore, an instructor at UNCG’s Lloyd International Honors College and a teaching assistant, is interested in international research with a focus on Africa. Study abroad at the University of Cape Town in South Africa magnified her experience. Moore combined the ethnographic research she conducted as an undergrad in Nigeria with her study abroad program in MAAS. She focused on immigrant women whose skills are considered blue collar in the United States and how bringing their skills here transforms their gender roles and social understanding of their lives here. She says that wouldn’t have been possible without the MAAS program. “It’s very difficult to find a program that has room for you to study outside of your program,” she says. Learning online was necessary for Moore. The flexibility allowed her to keep her job in the International Honors College. She worked during the day and did her coursework in the evenings, finding as long as she set a schedule and managed her time, she could maintain the workload. Professors offered support, advising her about time management and prioritizing assignments when she needed strategies for balancing her full-time job with the work. “They were pretty open to actually listening to your concerns and giving you advice on how to properly set things up,” she says. Collaborative assignments required teamwork. Her groups worked to create projects via video chats. MAAS courses have helped Moore gain global communication and critical thinking skills. But for Moore, a first-generation American, courses like Crossing Borders: Literature of Migration also had a direct impact on her understanding of transnational communities. As a Nigerian-American, she says it’s been challenging to find a sense of belonging that reflects her Igbo customs and values in a place that defines her identity as a single story instead of many. The MAAS program has equipped Moore with the scholarly and professional training needed to further her understanding of education in marginalized and colonized communities and global villages. She is now applying to PhD programs in educational leadership and cultural foundations, which will allow her to conduct advanced research and pursue an academic path. “The fact is you’re not going to school [with] or you’re not going to be teaching people that had the same experience as you,” she says. If you’ve never taken an online class before, you might be skeptical of the experience. Here are a few misconceptions we’d like to clear up to set the record straight. 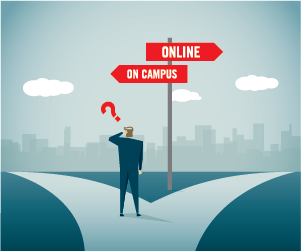 It’s no secret that online learning is flexible and convenient. 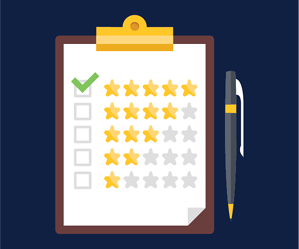 But how do you know if the program you’re considering will offer a high-quality learning experience? Start with these five questions.